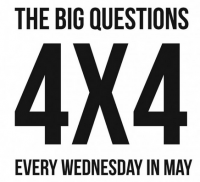 4×4 Manchester is a series of talks organised by URBED, held every Wednesday in May. This year’s talks look at our urban environment through the lens of Money, Love, War and Freedom. Four speakers talk for 15 minutes each. There is then time for lively audience debate. Glass-House Chief Executive Sophia de Sousa has been asked to speak at the talk with the theme LOVE. Hosted by Bob Phillips, Director of BPUD and Lecturer in Planning and Urban Design at The University of Manchester. Sophia will be taking a personal look at Love and the built environment, exploring both how and why she became so fasclnated by the connection between people in place, and why we fall in love, or not, with the places around us. 4×4 Manchester wants to challenge how you think about your discipline be that architecture, art, music, urban design, planning etc etc. This will not be architects talking about their new buildings or an author promoting their new book; 4×4 wants to promote a real debate about the state of our cities, stimulated by interesting, diverse and provocative speakers.